Manage your trucks and haulers easily from the desktop scale application. All recorded tares, new trucks, or other changes made at the desktop application will be sent up to the Fast-Weigh 10 Web Portal upon syncing. Find the Trucks screen by clicking the dump truck icon in the menu at left. When a truck arrives at the scale, you can capture the truck's empty weight (its tare) from the Trucks screen. Choose a truck by clicking the gray plus [+] sign next to TRUCK. 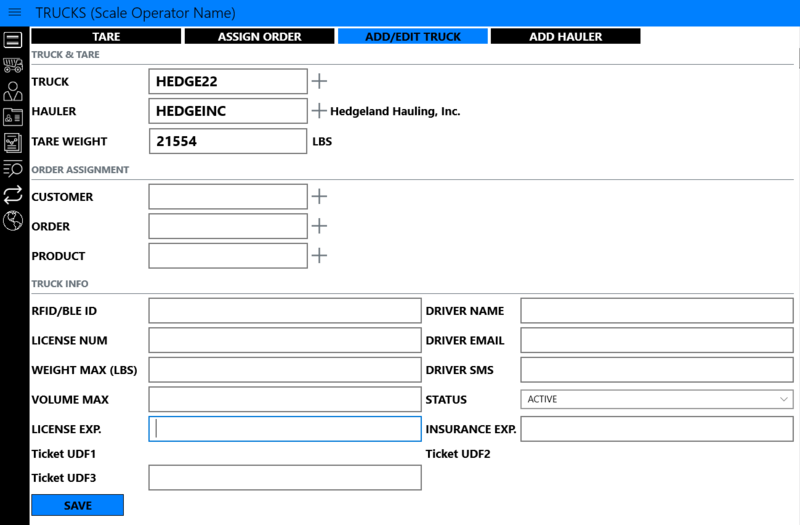 Or you may simply type the existing Truck ID and press Enter on your keyboard. Click the TARE WEIGHT field and enter the weight in the field by A] simply pressing Enter on your keyboard (the weight from a connected weight indicator will load in the field automatically) or B] you may type the weight in by hand. Click Save. Your truck has been tared and is ready for ticketing. Before new Trucks can be added to your Fast-Weigh 10 system, you must have one or more Haulers to attach them to. In most cases, the Hauler is a carrier, trucking company, or customer who owns the truck(s) you will be ticketing. You can also think of each hauler as a folder that one or more trucks belong to. All trucks must be assigned to a Hauler. One Hauler can have an unlimited number of Trucks attached to it. Even if a truck stands alone and does not belong to a larger trucking company, you will still need to create a hauler for it first and then create the truck. When adding a new truck on either the Web Portal or the desktop scale application, choosing a Hauler for that truck is a requirement. All Hauler IDs and Truck IDs must be unique. Hauler IDs can be up to 20 characters in length. Truck IDs can be up to 10 characters. Please use the Name field for the full hauler name. At the top of the Trucks screen, click the [Add Hauler ] button. Fill in the required fields: Hauler Name and Hauler ID. Fill in any optional information as needed. Now that you have a hauler, you may add new trucks to it. At the top of the Trucks screen, click the [Add/Edit Truck] button. Fill in the Truck ID (required). Then click the gray plus [+] sign next to HAULER to assign the truck to a hauler (required). Or you may simply type the existing Hauler ID and press Enter on your keyboard. Optional: You may add a tare for the truck, assign it to an order, or fill in any additional information under Truck Info. Your truck can now be used for ticketing. From the Trucks screen, any truck in your system can be selected, edited, and saved. Once a truck has been selected, you may edit any of the truck's parameters, including the tare, order assignment, and truck info. 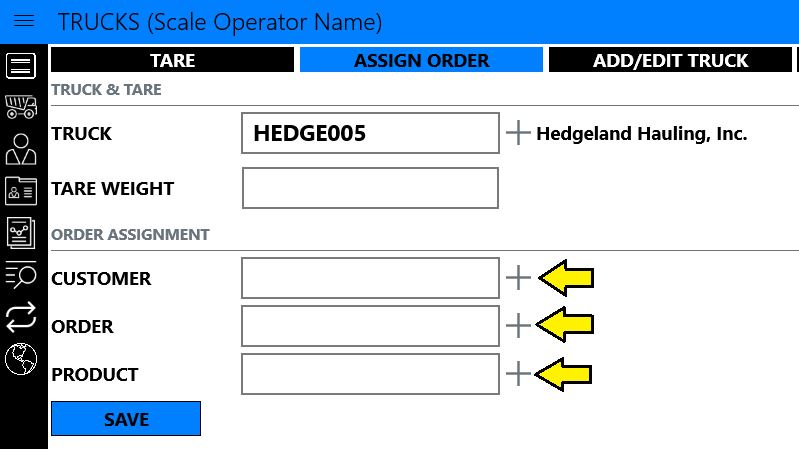 The order assignment feature allows you to assign certain Trucks to a specific Customer, Order, and Product, so your operators can enter much less information while ticketing. With the Truck Assignment feature, only the Truck ID is required to capture the gross weight and print a ticket. At the top of the Trucks screen, click the [Assign Order] button. Choose the Customer, Order, and Product you wish to assign the truck to. Your truck is now assigned. When you select this truck while ticketing, the Customer, Order, and Product data will load automatically. Truck Assignment can also be set up from the web portal.